If you go down to the woods today, you are in for a big surprise. Well not THAT big but if you have walked through Diggers Wood above Shipton recently, I hope that you’ve noticed a difference. A while ago, a few of us ‘last of the summer winers’ thought that parts of the wood were in serious need of some TLC. So we decided that, instead of wandering aimlessly around the village and sitting on benches reminiscing about the good old days when beer was one and tuppence, a pint and petrol six bob a gallon, we would do something about it. Once we had been given the go-ahead and obtained professional advice, we headed for the woods armed with chainsaws and loppers. “I counted them out and I counted them back,” not the famous reference to the Harrier raid in the Falklands but my wife’s comment about my fingers after the first session. 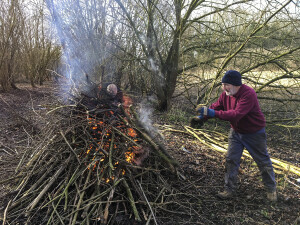 We are carrying out a programme of selective thinning, mainly by getting rid of damaged and malformed trees, clearing brambles and blackthorn and cutting back untidy undergrowth. The wood we cut is either burned on site or, if loggable, transported to the Wild Garden to be logged and sold on to provide them with extra funds. We have also cleared a couple of the glades and, in conjunction with the Cotswold Wardens, sown yellow rattle (a semi-parasitic wild flower that will weaken the grass and allow us to sow a woodland wildflower mix) and planted 100 bluebells. Subsequently, thanks to a generous donation from Shipton WI and help from Shipton Volunteers, we have planted another 400 bluebells. We meet about once a month at 09:30 (at our age it takes time to get out of bed) on a Friday morning so, if you are walking through the wood, please respect our warning signs as we would hate to bring a tree down on your head or throw you on the bonfire. If, however, on a bright chilly winter’s morning, you cannot resist that secret pyromania simmering within and would like to join us, albeit for just an occasional morning, give me a ring on 831127 and I will add you to our email list.